*****NOTICE TO CUSTOMER: If there is a problem suspected with the wiring harness, call Off Road Solutions. DO NOT cut, alter, or dissect the ORS battery harness. 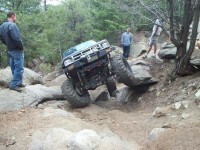 Off Road Solutions accepts no responsibility for a harness that has been tampered with – NO EXCEPTIONS. There is no warranty on the ORS 3.4L Battery Harness.This harness is designed to work with a “reverse” terminal battery, installed with the negative terminal on the LH side. Standard terminal batteries can also work, but are a tighter fit with the cables. Route the ORS battery harness along the bottom front of the engine, behind the crankshaft pulley. Connect the battery harness to the main starter terminal/post and the starter trigger terminal. Fasten the large ground in the battery harness to the lower LH side of the engine block, near the oil filter. The original battery harness had a plastic cover that retained the battery harness behind the crankshaft pulley. If available, this can be re-used on the ORS harness in the same configuration. If not, use the provided closed clamps to secure the battery harness to the front of the engine so that it cannot make contact with the crankshaft pulley. Failure to do so may result in FIRE. Route the battery harness under the steering shaft and up the inside of the LH side fender well. Using the provided closed clamps, secure the battery harness to the fender well and frame so that the harness is clear of the steering shaft. Connect the positive terminal to the battery. Splice the lead from the ORS 3.4L conversion harness labeled “to starter trigger” to the lead on the battery harness labeled “to ORS starter trigger lead” (these should both be black wires). Connect the fuse box power lead (explained in 3.4L swap instructions) and all other + battery connections to battery + terminal. Check over your installation to be sure the battery harness is not rubbing against any sharp edges or moving parts. Connect the negative terminal to the battery. Fasten the additional negative lead from the negative terminal to a good ground location on the inner fender well. If possible, connect the original vehicle alternator connector and cable directly to the alternator. In some cases the original vehicle’s alternator connector is a direct plug-in. If the connector is different, the connector pigtail from the 5VZ/3RZ alternator can be spliced directly to the original vehicle’s alternator wiring lead. This is also available as a ‘pigtail’ from ORS. 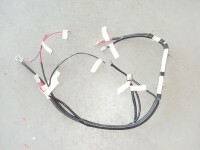 Simply cut the original alternator connector from the vehicle’s alternator lead and splice the 3 wires (leading into vehicle harness) to the 5VZ/3RZ alternator pigtail, matching wire colors. Then fasten the original alternator cable to the alternator post.